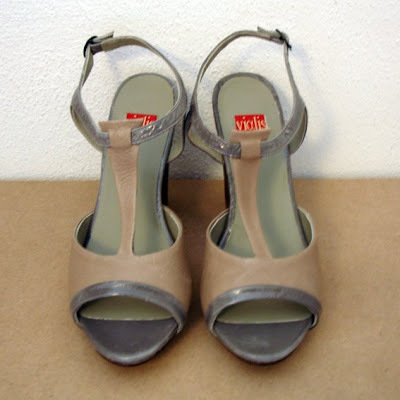 For the past centuries, Italy has been considered the leader in quality shoe design and manufacturing. A tag stating Made in Italy is always a quality proof. Although all those years italian craftsmanship never failed to produce little leather works of art, Spain is definitely taking the lead in the design aspect, incorporating new materials in more up-to-date styles. 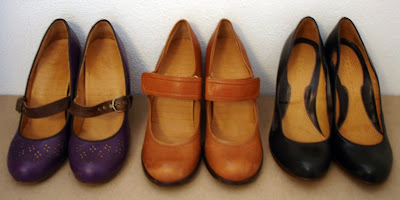 My favourite shoe designer, Chie Mihara, was actually born of Japanese parents in Brasil, but her company is based in Spain, where all of the above beauties were created, with sole purpose to come and find me and live with me happily ever after. In my humble opinion, she makes the ultimate round-toe maryjanes and pumps, complete with an anatomic foot bed insole. Her shoes are rather expensive, but I prefer to treat my feet with one of her masterpieces than three pairs of Zara pumps that will kill my feet. Another personal spanish design staple is Camper. The brand needs no further introduction, everyone knows about the quirky shoes that were actually made to walk in. That is, walk a lot in. I won't lie, many of their designs are a bit rough and not exactly lady-like, but amongst these there are some real gems waiting to be discovered. My collection was recently updated with the above three pairs, bought from Camper's online shop on sale. Welcome to the Shoeaholics League. You're in good company. Meaning mine. ;) Hope you can join us in the shoe exchange - new kicks for the price of postage! But not if, as you mentioned, that means offering up your first born for the post fee. I've been a Camper fan for AGES, and remain loyal. Chie Mihara's designs appeal, but I generally spend my big buxx money on a Canadian named Fluevog. I do agree that Spanish shoes are typically of good quality and great style.